The Fiqh Council of America announces Wednesday the 16th as the 1st day of Ramadan. Taraweeh starts Tuesday night. “The Astronomical New Moon is on Tuesday, May 15, 2018 at 11:47 Universal Time. 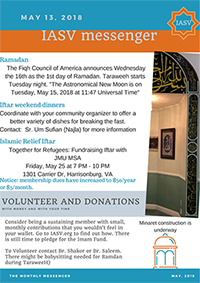 Please view the Ramadan issue of the IASV Messenger for more information.